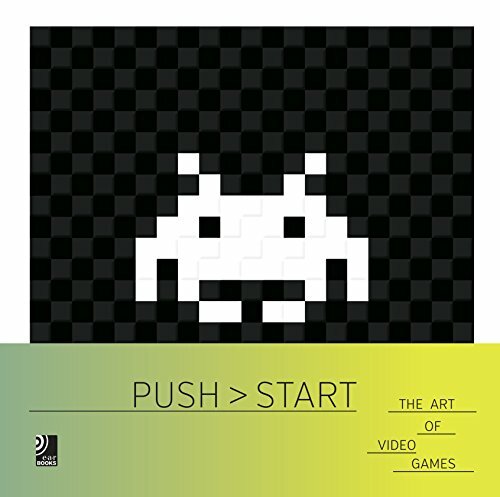 Push Start: The Art of Video Games is a much larger and thicker book than I had expected. There are actually 380 pages rather than 220 pages as listed at some places. The cover is nicely embossed with lots of squares to form a huge black square. A Space Invaders alien is formed like pixel art using white squares. The content is arranged in chapters by the technological advances in the graphics, moving from early games to arcade, then 8-bit, 16-bit, 3D and finally to HD. Within those chapters, the games are arranged in chronologically. Each chapter has a paragraph or two talking about the evolution of technology. The games featured come mostly with one screenshot each, either of an in-game scene or a closeup to the main characters. Some of the graphics are spread over two pages. Most of the included games are from the days before XBox and Playstation, so there are a lot of pixel art. I felt that the book is somewhat lacking in depth. Other than the creator credits, there aren't any additional information talking about each game. The only substantial writeup appears at the back of the book in the form of an intellectual essay that tries to answer the question on whether video game is art. It involves tech talk on technology, the design of the gameplay, and what the developers are trying to achieve. I bought the book without much expectation. After going through the book, I'm left without much impression and I felt like I didn't learn anything much about the art in or the art of video games. Over the years, several books were released on video game art, such as The Art of Video Games: From Pac-Man to Mass Effect, The Art of the Video Game, Neoludica Art and Videogames 1966-2011 and the somewhat related An Illustrated History of 151 Video Games. Most are mixed bags. Video games are very personal. You will like different games than me. The list of games included in this book works more like an index, a glorified index with huge splash pages of pixel art. Even for the screenshots included, I felt that some aren't truly representative of the games. But it's difficult to have one image represent the games well. If you want to learn more about the art used in video games, I suggest checking out The Art of Video Games: From Pac-Man to Mass Effect instead, which is slightly better. Lastly, this book includes a 10-inch vinyl and a download code to the songs included. There are eight remixed versions of the classic tunes from Super Mario, Castlevania, Mega Man, Ninja Gaiden, Street Fighter, Puzzle Bobble, Space Harrier and Tetris. You can visit the publisher earBOOKS Youtube channel to search for "Big Twice Remix" to sample to the songs. This is quite a pricey book so I definitely recommend flipping through before buying.